Ornithology is the classic text for the undergraduate ornithology course, long admired for its evolutionary approach to bird science. 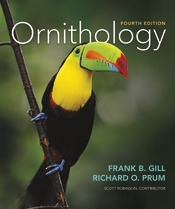 Ornithology, 4th Edition is a comprehensive introductory text covering a wide scope of topics essential for understanding the field of ornithology. This new edition infuses the most current research and a more conceptual approach alongside an evolutionary perspective. The 4th edition retains its hallmark readability, as well as a well updated narrative and bibliography with the latest scientific content and references. The 4th edition will be the first in full color in both art and design and will include over 400 color photographs. The updated design is clean, colorful, approachable, and easy to use as a narrative or study reference. New pedagogical elements reinforce key concepts new end of chapter assessment questions allow students to evaluate their learning. The 4th edition is the best yet, during both a student’s first read, and when revisited as a reference.